Trade between Myanmar and members of the Association of Southeast Asian Nations (ASEAN) reached 5.7 billion U.S. dollars in the first half of the current fiscal year 2017-2018, official Global New Light of Myanmar reported on Thursday. Burma Campaign UK is planning to revive its ‘Dirty List’ strategy of naming and shaming companies linked to human rights violations in Myanmar, the London-based activist group said on November 8. Proposed sanctions against the Myanmar military should move quickly through the U.S. Congress due to strong bipartisan support, lawmakers told VOA. With more than 600,000 Rohingya refugees in Bangladesh camps and untold numbers of Rohingyas in need of aid still in Myanmar, UN humanitarians pleaded to the Naypyidaw government on Thursday for access to northern Rakhine State. Myanmar on Tuesday warned that a United Nations Security Council (UNSC) statement on the northern Rakhine crisis could “seriously harm” talks for the repatriation of over 600,000 Muslim refugees who fled to Bangladesh following clashes between the Tatmadaw and the Arakan Rohingya Salvation Army (ARSA) terrorist fighters. Israel says it sold arms to the Myanmar army because it understood the situation in the country better than the UN does, Haaretz reported the Deputy Consul General in New York, Amir Sagie, saying. Myanmar’s most senior Catholic prelate has urged Pope Francis to avoid using the term ‘Rohingya’ during a visit this month, when he is expected to raise the humanitarian crisis faced by the Muslim minority after a Myanmar Army offensive in August. State-run people’s hospitals across Myanmar including intensive care units are being upgraded as millions of patients are admitted to them every year, according to the Ministry of Health and Sports. The Mawlamyine Airport’s runway will be upgraded in the 2018 budget year. Over 5000 feet of the runway will be altered, confirmed the Department of Civil Aviation in Mawlamyine, Mon State. A total of K114 million will be spent to repair the runway. JAPAN’S biggest airline All Nippon Airways is backing out of a US$25 million local joint venture after a communications breakdown between the airline and government authorities. The collaboration could have resulted in the country’s first partnership with an international airline. Two documentaries that shine light on the struggles faced by Myanmar people both in and outside the country will be shown at the Unesco town of Luang Prabang, Laos in December as part of a Southeast Asian cinema showcase. 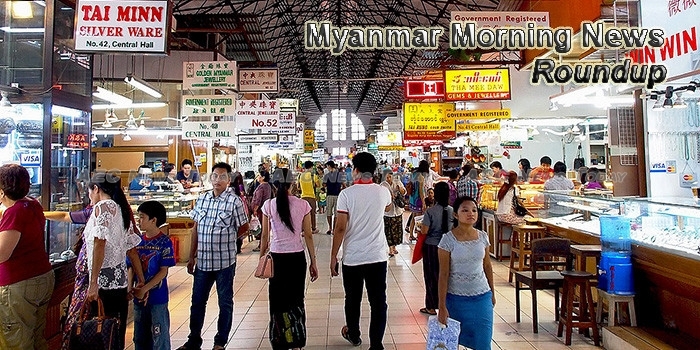 Yangon, the commercial capital of Myanmar, has hosted various expos from building materials and furniture to automobiles and industrial machinery. But an ongoing expo on the 21st floor of Junction City is the first of its kind—an art expo. Under the governance of the National League for Democracy government led by President Htin Kyaw and State Counsellor Aung San Suu Kyi, Myanmar has witnessed many remarkable improvements in its legal, social, and economic commitments in the past two years—especially in respect of the legalization of market sectors and the promotion of foreign investment. As many as 18 village leaders who had worked on the issuance of national verification cards in Myanmar’s violence-ridden northern Rakhine state have been killed in the last three months in Muslim-majority Maungdaw and Buthidaung townships, a state government official said Thursday. A Myanmar national planted a pen with a pinhole camera in the toilet of a maisonette to capture his female co-tenants showering.